Well it looks as though summer has left us behind and autumn has well and truly set in. Now that you’re indoors a little more, it’s a great time to sit down and catch up on those things you know you should do but keep putting off. Well it looks as though summer has left us behind and autumn has well and truly set in. Now that you’re indoors a little more, it’s a great time to sit down and catch up on those things you know you should do but keep putting off. Hey, I’ll be the first to admit we all have a little procrastinator inside of us and we still get by. In our busy lifestyles today, unless something is urgent, we tend not to place a high priority on it, yet those things we keep putting off will one day become urgent before we know it, and something that seemed insignificant before suddenly becomes a huge priority. Have you ever experienced something like that? Becomes a bit stressful doesn’t it! Sitting down and taking a look at your budget is one of those things that tends to get put off. My philosophy on budgeting is KEEP IT SIMPLE. EVEN IF YOU ONLY DO IT ONCE A YEAR, THAT’S GREAT! It’s better than not doing anything at all and then realising all too late you’re spending every cent you’re earning. The scary thing is, that’s literally what most of us do! With a mortgage, personal loans, credit card debt, store accounts, every day living expenses and entertainment money sucking our wages every week Australians can now literally spend every cent they earn without even realising it. In fact finance issues are one of the main causes of divorce! THATS WHY IT’S WORTH YOUR TIME TO SLOW DOWN FOR A FEW MINUTES and double check how much you are really spending. Now there are a huge range of products out there to get your budgeting under control but I really believe a lot of them are over complicated, expecting you to update everything you do, everyday. You know what I mean don’t you? Realistically, these kind of programmes seem great at first, and can be really effective if you have the discipline of a 1920’s school mistress, but most people I come across find that after a week or two of punching every single detail into an excel spreadsheet, they start to lose interest, get disheartened and get off track which makes the budget planner completely ineffective. This month my suggestion to you is this; Take a few minutes and do a quick budget RIGHT NOW. I’ve provided you with a very simple budget planner that is designed to give you FOCUS on how much you’re spending, and you can do it quickly! If you find you’re spending every cent you earn and haven’t put any money away for a holiday or a rainy day, chances are you need to revisit how you’re managing your money before it’s too late. What debts could you reduce?SUPRISED AT YOUR RESULTS? What expenses can you cut out? Are you paying your bills on time? Could you save money on your visa card and other bills by not incurring interest or overdue charges? Are you putting money away for savings? Are you making sure you pay yourself first? Is it time to invest in a ‘no junk mail’ sticker so you’re not tempted to buy things from a catalogue that you don’t really need? Maybe it’s time to give up some bad habits! This can have a double benefit by saving money too. Giving up smoking, drinking or even eating too much junk food are expensive bad habits that could save you heaps of money if you give them up. The bonus is you’ll feel great for giving them up as well as saving money. A great way to stay focused when you’re budgeting and saving is to work out what your main goal is for this week/month/year (for example you may like to save for a holiday) and put a picture of this goal where you can always see it. What you focus on, you will achieve. THINK ABOUT THIS; What you focus on, you naturally gravitate towards. If you really want something, your brain will work out a way to get. You know what it’s like when you’re looking for a new car. Say if you want to buy a VW beetle, all of a sudden there seems to be a lot more VW beetles cruising the streets. Now you know in actual fact there are just as many as there was before, it’s just that when you focus in on something, your brain makes it a higher priority! JUST FOR THIS MONTH, WHY NOT MAKE YOUR FOCUS YOUR FINANCE, starting with your budgeting. And remember, even if you only do this ONCE A YEAR, imagine the impact it could have on your finances and your lifestyle……and imagine what could happen if you don’t. Remember, if you were surprised at your results maybe it’s time to get out the clippers and start trimming! A great site to get some really useful money saving tips is simplesavings.com.au . The link above gives you access to their free bill payment system. You can download it instantly for FREE! “Paying your bills promptly will help you avoid late fees and interest charges. We can show you how to keep your finances in good order with simple steps and equipment. You don’t need fancy supplies, spreadsheets or costly pre-programmed packages. With the help of a few standard office supplies, you can have your bill payment system ready to go”. 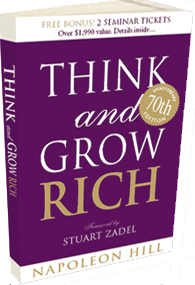 Get your FREE COPY of the worlds best selling wealth creation book of all time! Just scroll to the bottom and claim your free digital version of the book. “This book is a collection of principles for the attainment of wealth and financial independence. It was written by Napoleon Hill at the behest of American steel magnate Andrew Carnegie, who was fascinated with success and wanted to understand why some men became successful while others in very similar circumstances did not. Over two decades, Hill interviewed 504 people, including such luminaries as Ford, Wrigley, Wanamaker, Eastman, Rockefeller, Thomas Edison, Woolworth, Darrow, Burbank, Morgan, Firestone, and three United States Presidents. Most of those interviewed began in poverty, with little education and influence. Yet, they all managed to become very successful at amassing staggering amounts of wealth. Hill distilled his findings into a 13-step formula that begins and ends with very basic principles”. Oh and if “think and grow rich” inspires you to go on and make millions, you can thank me then! Just so you know, I gain absolutely nothing from referring you to these web sites apart from the satisfaction of knowing I may have helped give you a gift that could change your financial future. I spend hours researching online to find free items and am happy to share the valuable resources I find with you. I HOPE YOU TAKE ACTION AND AS ALWAYS, HAPPY SAVINGS!